Comfortable sailing around the bay doing dead reckoning and ready for the next step? Ready to be challenged with strong currents, fog, and tricky anchorages? Let’s sail to Martha’s Vineyard and the surrounding islands for 5 days and be mesmerized with the incredibly strong currents of Wood’s Hole, experience the serenity of sailing at night, and enjoy some fabulous seafood. The schedule is loosely structured as wind and tides dictate the actual daily destination…just like cruising! 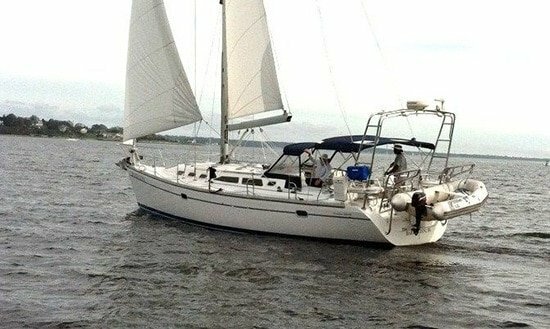 This is a serious coastal cruising course where you live on a larger boat and will have opportunity to build your seamanship skills. We will stop at various anchorages along the way, applying the advanced navigation techniques learned in ASA 105. We will discuss advanced sail trim, weather, boat systems, and advanced navigation techniques. You will come away with your seamanship skills kicked up a notch and have a better idea of what actual cruising is like. Half the folks that take this course are not interested in the certification… They just want to go sailing with a captain and visit a number of wonderful anchorages at a reasonable price! Folks often take this course more than once as everyone is different. As with any coastal cruising trip, we plan our next day’s journey factoring in the forecast wind and weather… No two trips are the same! We can add ASA 105 to this course for $395 per person with some class time beforehand to go over the theory and practical applications on the trip.